We were amazed that with so many items we tried during the food tasting, there were still loads more in the menu to be explored. In brief, this is a place worth visiting if you would like to try different varieties of home-cook meal (no MSG). I like the relaxing ambiance where most of the walls are colored blue. I believe it is also a cozy spot for chit chats in the afternoon. 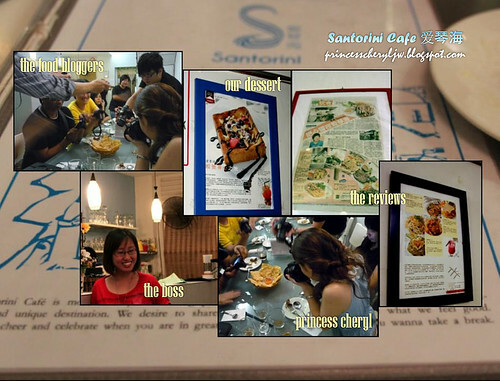 Santorini Signature Coffee (Cold RM6.00; Hot RM5.00) - Coffee for anyone. Thirst Quencher (RM5.00) - Mixed of red plum and some other fruits. Let me start with the oriental choices first -- the rice and noodles. 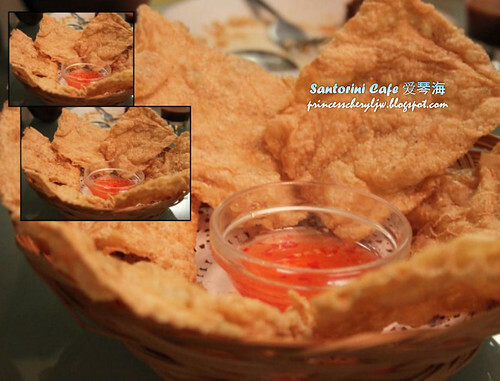 Santorini Cracker (RM4.90) - Referred as Pok pok chui which is one of the popular finger food/snacks from Kampar. 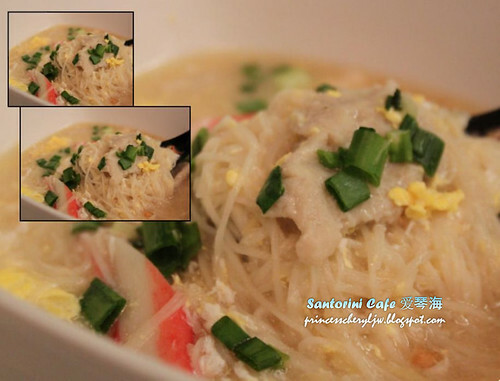 Santorini Drunken Mee Suah (RM6.90) - Wheat Vermicelli cooked in thick base soup with seafood and egg. It's not as sticky and as thick as stew like the Mee Suah Kor, but in between soup and stew. 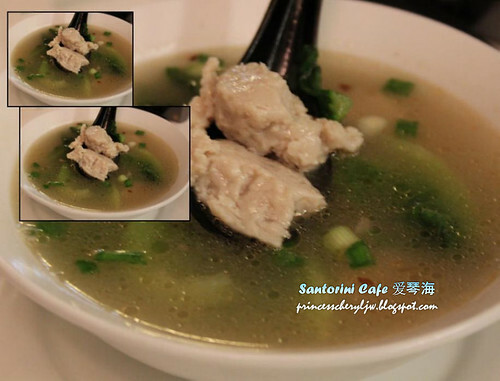 Santorini Kampar Yue Wat Soup (RM5.90) - Unlike fish balls, "yue wat" are not specifically shaped. These are home made "yue wat" prepared by one of the lady bosses who is from Kampar. The soup is superb, sweet yet no fishy odor. 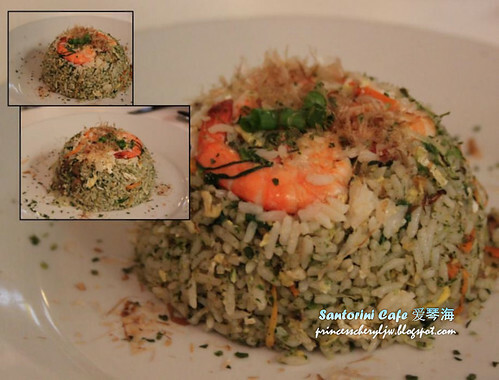 Santorini Seaweed Fried Rice (RM6.90) - For those who love seaweed, this is quite a good choice. Garnished with bonito flakes. Santorini OH! mama with rice (RM8.90) - Chicken cooked in sweet soy sauce and some secret ingredients. Served with rice. 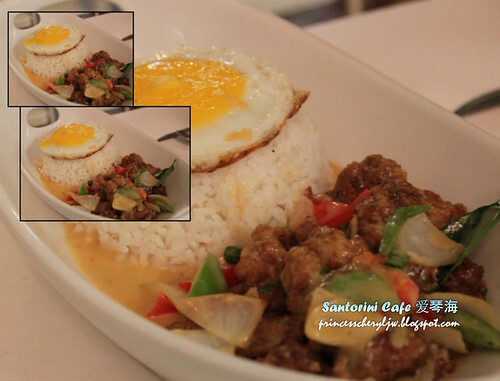 Santorini Butterine Mantis Prawn Rice (RM7.90) - This dish comes in 3 choices of meat: Chicken, Fish or Mantis Prawn. Oriental delight. 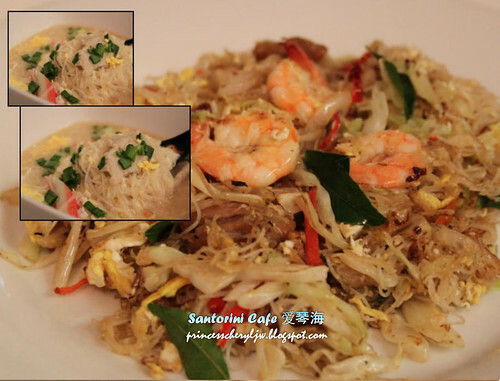 Santorini Fish Sauce Bee Hoon (RM5.90) - Fried rice Vermicelli with fish sauce (鱼露). Particularly a common seasoning in Asian cuisine (Thai, Vietnam, Chinese and Korean cuisine). 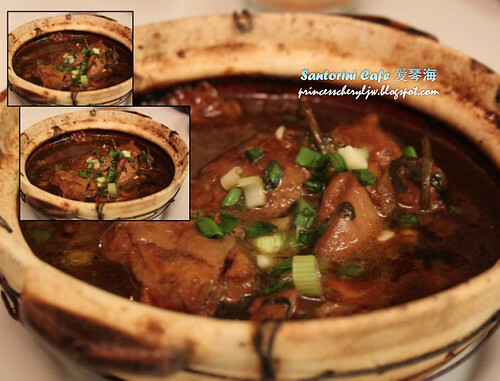 According to the owner, this dish was learned from Sarawak. 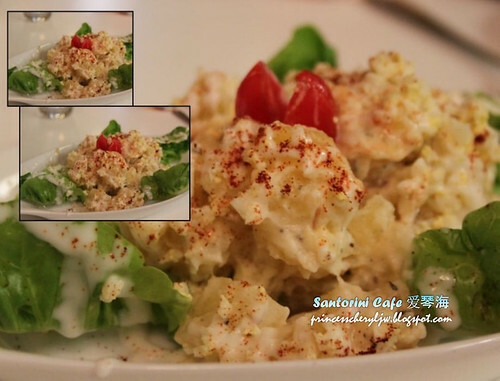 Santorini Potato Salad (RM5.00) - Potato in cubes and slightly mashed with mayonnaise dressing and a sprinkle of paprika. Oat Fish Chop (RM12.90) - Another western delight. Had enough of traditional fish-n-chips? Try this. 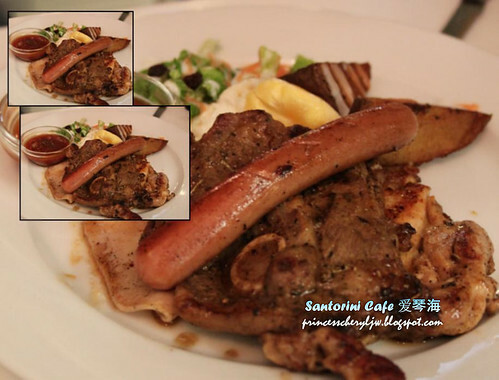 Mix Grill (RM20.90) - All time favorite! Lamb, chicken, sausage, ham and egg. 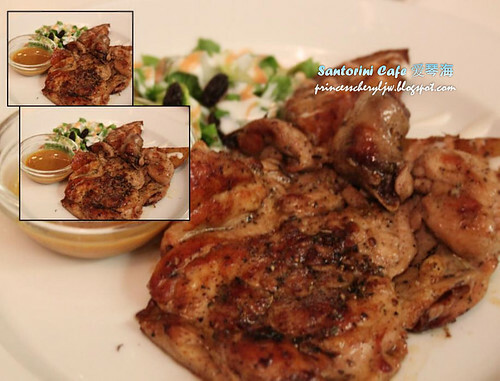 Santorini Coffee Chicken Chop (RM13.90) - Ooo... I smell coffee. 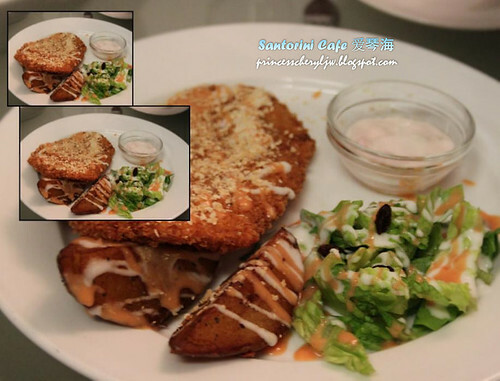 It's a 2-in-1 combo for coffee lover, feed yourself with caffeine while munching the fried chicken chop. The dressing blends well too. Her-Mus-Ney Chicken Chop (RM11.90) - My favorite and most recommended dish of the night. 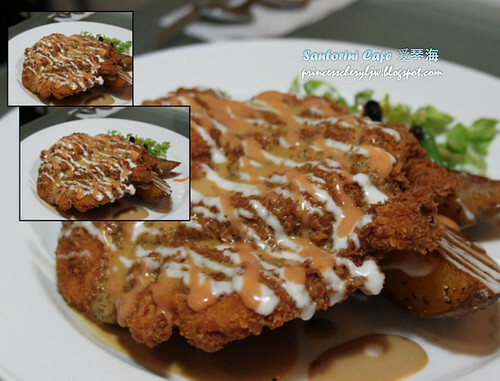 I simply love the special mix honey mustard sauce served with grilled chicken chop. This is the typical sauce for western food, popular choice in the USA, Caucasians don't take that much of chili/tomato sauce like we Asians do. Last but not least.... dessert time! 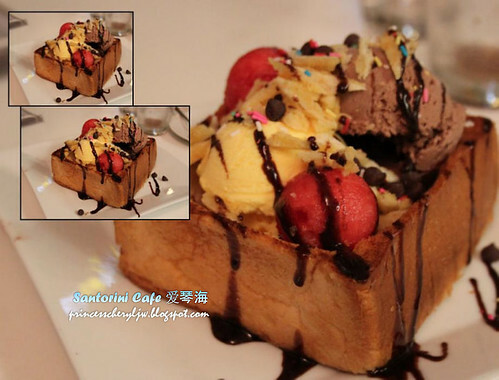 Wonder Box (RM6.00) - Ice cream stuffed in a "bread-box", topped with chocolate chips and watermelon. So beautiful. And colorful. Does it make you feel happy before you even eat it? 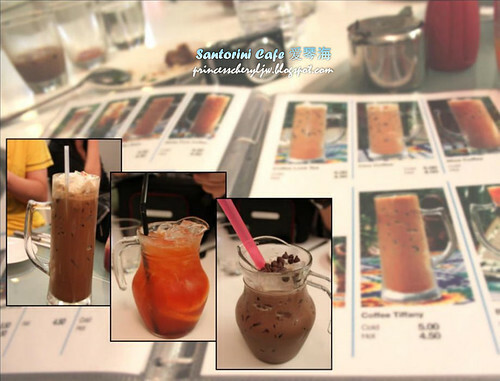 Santorini cafe is located next to the Chew Tian Yang Aquarium and Little Cottage along Burma Road. Customers can park in front of the cafe (compound) or along the roadside after the turning right at the subsequent junction. For those who park at the aquarium car park or New World Park car park, a refund of RM1 will be given when you present your parking ticket to Santorini Cafe (1 single bill max 2 tickets). PRICE SHOWN IS NETT, NO SERVICE TAX or GOVERNMENT TAX . 94, Burma Road, 10500 Penang. 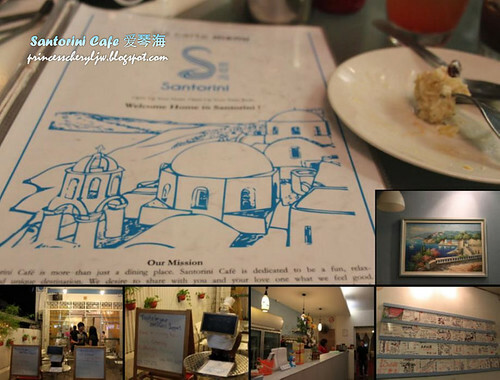 Too bad, now all the western food served in Santorini does not come with french fries.